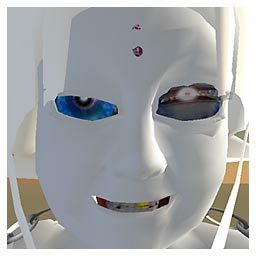 Another featured nominee from the Extraordinary Avatar Expo, my search for the strangest, weirdest, and most fantastic non-human avatars in Second Life. Previous entries include The Arabian Phoenix of Psyra Extraordinaire. always one of the appeals of the Net in general to me (and lots of others I'm sure)-- that people are only seeing your mind. So, as you can see, I had Beta, and Zeta, and Andro... But I still wasn't that happy with it-- except for the hair. The hair has been with me since the beginning. It just came to me at some point that I wanted something small and more tabula rasa. Cute yet creepy. I also wasn't fond of the walking animations, so I set out early on trying to keep myself in [floating] yoga pose. Eventually made that and the custom typing animation [Max rubbing his temples, in a telepathic manner]. As far as attachments, most were motivated by need. Like the Mobius strip on my wrist, [which] has some various utility scripts and objects-- altimeter, compass, floor, etc. The chain was a gift from Shelaura Tomba. The moving eye came later, when it just occurred to me that I wanted something more asymmetric. A little. My main roleplay is to not put any outside money in, beyond the inital $10 for a Basic [account]. I decided early on that my first goal was going to be to bootstrap my way up to a Premium account for the year-- that took about 6 months. I wish I could get a free account today. There would be something purer about it.